Baltimore’s creative communities are coming together to increase access to and support for the arts and culture in Baltimore. Sign up for action alerts to address these issues and more! Register to vote with a political party in order to participate in the primary and general elections. Take action to help artists, cultural workers, and all Baltimoreans! Candidates answering questions at the CItizen Artist Baltimore Mayoral Forum in front of an overflow crowd of over 540. Baltimore is home to thousands of voices and voters who are also artists, theater, concert, and museum-goers, and creative workers. We care about core civic issues like jobs, education, and affordable space. Citizen Artist Baltimore (CAB) is an advocacy effort to build community among, and mobilize thousands of voices within Baltimore City’s creative communities. CAB conducted a series of listening sessions across Baltimore City from which we identified the top priorities of Baltimore’s creative communities. 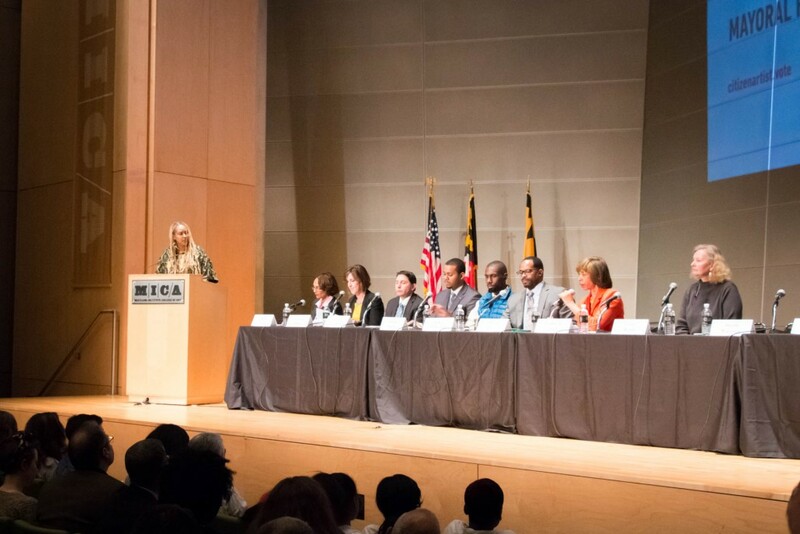 Leading up to the 2016 election, we registered voters and provided the opportunity for mayoral candidates to outline their positions and goals related to arts, culture and humanities through a robust questionnaire and candidate forum. Founded on grassroots coalition building and community engagement, CAB is combining the strengths and addressing the needs of arts and cultural communities across the entire city.